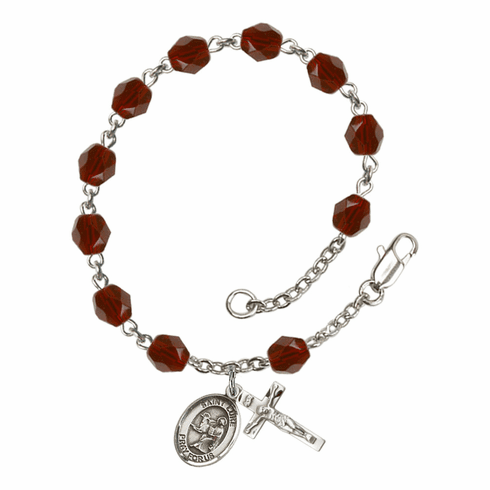 This beautiful patron saint silver plated rosary bracelet features 6mm fire polished crystal birthstone beads available in all birthday months. All bracelets come with a charm saint medal and crucifix in a deluxe gift box. All Bliss Manufacturing jewelry is made in the USA by skilled craftsmen. Birthstone: " January - Garnet" " February - Amethyst" " March - Aqua" " April - Crystal" " May - Emerald" " June - Light Amethyst" " July - Ruby" " August - Peridot" " September - Sapphire" " October - Rose" " November - Topaz" " December - Zircon"